CMWL offers the leading physician-driven, clinically proven weight loss approach that can help you lose 21 pounds in just 12 weeks! 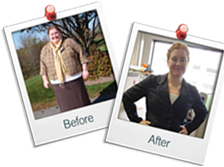 ** And you’ll gain the tools and confidence to learn how to maintain a healthy weight for life. Search for a local CMWL center using our Find A Center Tool. Make an appointment for an initial consultation with the doctor (tell them you are calling about the Oxford Healthy Bonus promotion). Print out this page and bring it, along with your Oxford Member ID Card, to your initial consultation appointment. Note: There may be a nominal fee for your initial consultation visit. The discount applies with your selection of a 6-week pre-paid program. For patients with a Body Mass Index of 30 or higher, offer cannot be combined or used in place of Oxford Health Plans obesity counseling insurance benefits in CMWL Centers where Oxford insurance is accepted. For qualifying patients, the Oxford participating center will explain how obesity treatment insurance coverage may decrease the cost of programs further. *Offer is made available through the Oxford Health Plans Healthy Bonus discount program and is valid through December 31, 2013 for new patients only at participating centers in the Oxford Health Plan service areas in NY, NJ, CT, DE, and PA. May not be combined with any other promotional offers. **Average weight loss at 12 weeks on any full or partial meal replacement program was 11.1% excess body weight. Based on a study published in the American Journal of Medicine in June 2012.